At the beginning of the year I made a resolution to spend more time crafting and doing small projects. If you saw my mid-year review last month, you know that it hasn’t happened. 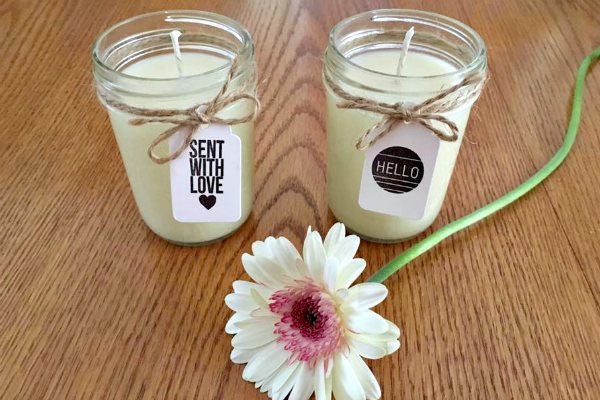 So when Labor of Love Co. asked me to try out their DIY soy candle making kit, I jumped at the chance! The kit arrived a couple days before I left to visit my parents, so I decided to bring it with me so my mom and I could try it out together. I picked the Honeysuckle Jasmine kit, but they also have Apple Harvest, which would be perfect for fall. The kit comes with everything needed to make two soy candles except for a small pot and a bowl to melt the wax in. Don’t worry about ruining your bowl either. 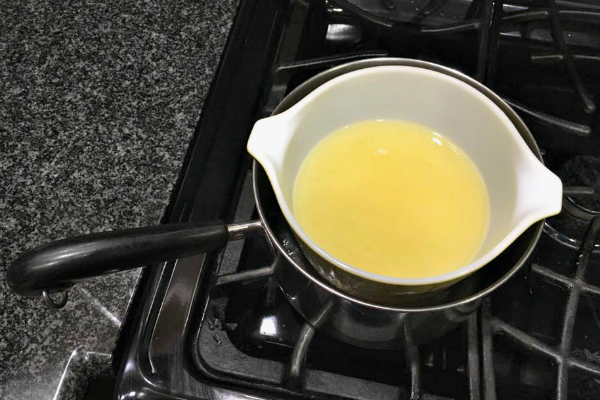 We used a small vintage Pyrex bowl and the wax cleanup was super easy. My mom just washed the bowl in warm water after we finished pouring the wax and it came right off. The detailed instructions that came with the kit were easy to follow and made the whole process super simple. You could easily do this with children (although an adult should pour the hot wax). This would also be a fun activity for parties or would make a great gift! As I mentioned above, the kit comes in 2 scents, but I strongly recommend the honeysuckle jasmine. It smells ah-mazing! Seriously, my mom had me save a bit of the fragrance oil so she could wear it as perfume for a couple days. 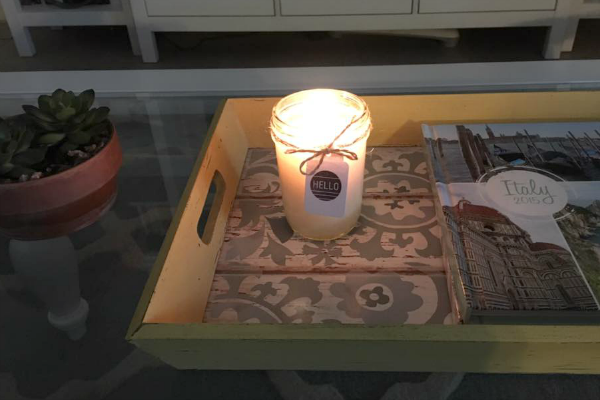 It smells wonderful when the candle is burning too! OK, so who wants to win a kit?! 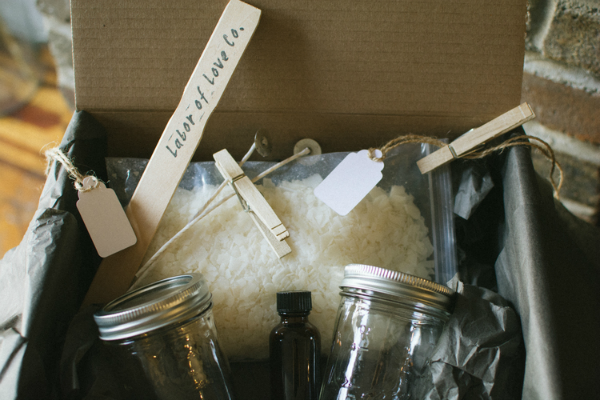 Labor of Love Co. has generously offered to send a kit to one lucky reader! Giveaway is open to continental US residents only. The only mandatory entry is to follow Labor of Love Co. on Instagram. All other entries are optional. I will contact the winner when the giveaway closes. Good luck! 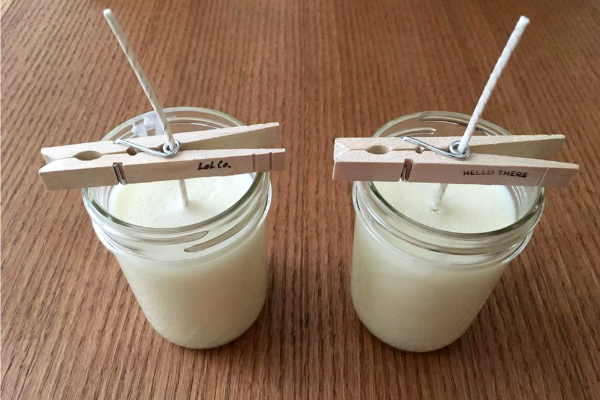 I was provided a DIY Soy Candle Kit for review, but was not compensated in any other way. All reviews and opinions are my own. Giveaway ends August 31st at 11:59 PM EST. Open to continental US residents only. Prizes cannot be shipped to PO Boxes. Winner will be selected by Random.org and be notified by email. Winner have 48 hours to respond before a new winner is selected. Please note that Away She Went is not responsible for sponsors that do not fulfill their prizes. I have represented each sponsor with the expectation they will fulfill their prize and in a timely manner. I will contact the sponsor regarding your prize(s). The sponsors, in most cases, are shipping their items to you directly. I will make every effort to assist you obtaining your prize within reason. By providing your information in this form, you are providing your information to me and me alone. I do not share or sell information and will use any information only for the purpose of contacting the winner. Is it possible for a candle to look delicious? I love it! You so craftyyyy! I love to make candles. This will be fun! I would love to win this for my niece. She adores all things candles. i've never made a candle before, would be fun! This candle making kit looks super fun! Would love to win to make with my daughter :) Thank you for the chance! I really want something like this for my daughter in law. She mentioned it this weekend that she wanted homemade candles. I would love to try this Candle Kit. It looks so interesting! I'd love to try making candles. Thanks for the chance to win. This candle sounds so soothing. Thanks for the chance to win. My daughter makes candles, she would love this.